Esalen has a way of gently prodding you to look within. The area is remote–although they are able to get Wi-fi with a satellite, there is no cell phone reception, nor are there any attractions nearby to distract you. All you have is Esalen itself. Some might say that this place has a special energy about it, and I do not disbelieve that. However, it also makes sense that when all of your needs are met and you are thus surrounded by the glorious spectacle of nature, you are compelled toward introspection and deeper thinking. Having said that, during my time here, I’ve been thinking about the various cycles of my life. I mentioned in my first post that only six years ago, I was in a position similar to the one I’m in now. Being here has, for me, made me aware of a cycle having just ended in my life. An ‘end’ of any kind can be a melancholy thing, but with every end there is a beginning. It’s like the uroboros, that ancient symbol a snake eating its own tail. It represents the cyclical nature of things–the ending in the beginning and the beginning in the end. Naturally, my thoughts turned toward: what did I learn from the last cycle? And what do I hope to see in the next? What new adventures and opportunities await? To what new countries will I travel? The prospect of a new beginning can be daunting, for sure, but it’s also exciting. In yoga, the Pranayama practice focuses on the slowing of the inhale and the exhale, but also a mindfulness of the pause between those breaths. 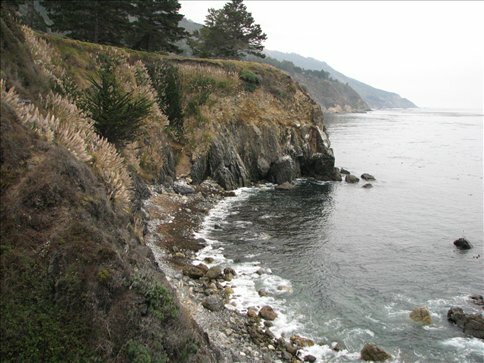 For me, Esalen is the pause between breaths. A place where time stands still. And now it’s time to take a mighty inhale again as I re-enter the world and leave the magic behind…at least until the next time. I look forward to you joining me on my new adventures.